Today many Anglicans around the world commemorate the Feast of Charles Stuart, king and martyr. Last weekend, on Saturday, I had occasion to preach for a Holy Eucharist commemorating Blessed Charles. I had never been to a service remembering him, though I’ve long been a fan of his being on our sanctoral calendar. I’ve written about this on 7WD here and here. My sermon was preached without notes, so I can’t share it here. Even if I could, it wasn’t my best sermon ever. Still, preparing for it raised a couple of thoughts I wanted to blog. Also, I do want to note for any Standing Commission of Liturgy and Music members who happen to read this, that Charles’ “cult of devotion” is strong enough that he merits a place on marquis signs! Can that be said of others who are proposed for inclusion in our official calendar? I noted in my sermon how strange it is that the only Anglican to have been formally canonized by an Anglican church — with an internationally active devotional society (UK or USA, among others) — is not commemorated on our official calendar. The usual reasons given for resisting his inclusion are puzzling to me. As I also said, Charles Stuart was a bit of jerk. He insisted on the divine right of kings and didn’t much like it when mere mortals questioned him. He relentlessly pursued an agenda of royal prerogative to the detriment of parliamentary authority. And on and on. So we resist including him because his politics do not suit us (no one wants to encourage authoritarianism, especially now) and because he was a jerk. But here’s the thing. Disciples and jerks are an overlapping set. None of the saints is perfect. In fact, it is precisely the fact that Christ’s perfect love radiates from imperfect lives that makes saints worth our devotion. That’s precisely the transformative power of the Gospel at work. Charles had one important way in which he practiced saintly virtue, and that’s the thing that we need to pay attention to. If you don’t know Charles’ story, the first link on this page has his Wikipedia article, which has a decent summary. Short version here: after he was arrested by parliamentarian forces, he was offered a deal. If he would abolish the episcopate in the Church of England, his life would be spared. But Charles literally valued what he understand as godly church authority and structure more than he valued his own life. Jesus has stuff to say about how, as disciples, we should be ready to trade our lives for the sake of the Gospel. Today our church is not under the same kind of threat in Charles’ day, at least not in the United States. But the pressures undermining the godly character of the church are no less real. No one from outside church is asking us to change our apostolic polity. But there are very real existential threats to the church and its witness. From outside, the church is always under pressure to conform to secular, political, commercial ideas. This is not new. Nearly from its beginning, the church has been pressured not to rock the boat against politics and commerce. We are told not to make the Gospel political. We are told to preach a message that softens Jesus’ absolute challenges against wealth and idolatry. From inside, the church is under pressure to preach the Gospel of Nice, in which we imagine that somehow our task is to “get along” and not do or say things that will disrupt imagined communities. These days, our sacraments are under siege, as people mostly from within the church teach (with good intentions, I believe) a message that discipleship isn’t relevant to baptism, eucharist, and our sacramental rites. We overlay the Gospel of Nice, and think that our task is to make it easy to be a Christian and enjoy the sacramental life. 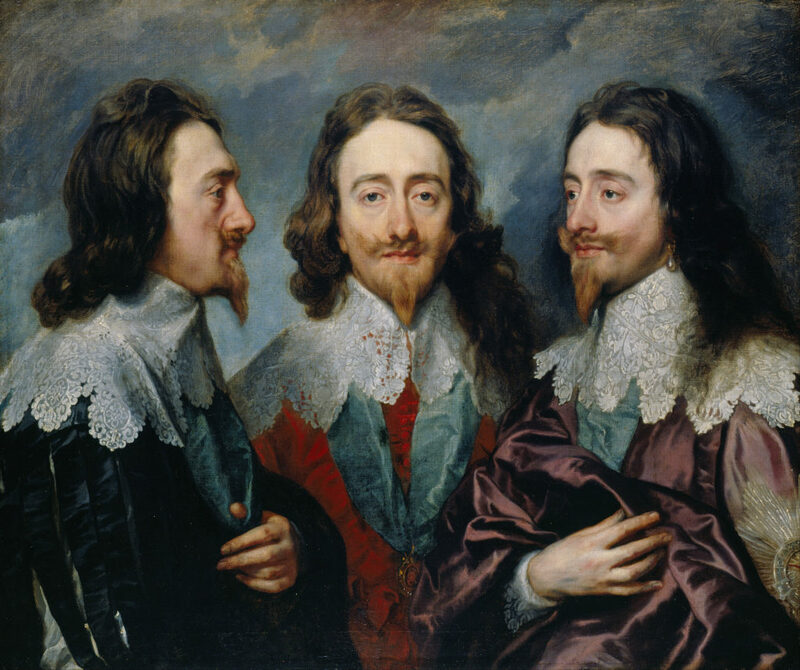 Here we might do well to draw inspiration from Charles Stuart. I’m not suggesting we should be jerks for the sake of being jerks or that we should not value representative governments. Nothing of that sort. But I am suggesting that we might up the stakes a bit when it comes to our willingness to preserve and protect that radical witness of the church. In this day and age, in my view, we need to recall that being a disciple of Jesus Christ isn’t easy. If it’s easy, we’re doing it wrong. And if the church is doing its job, it will get into trouble. ‘Twas ever thus. Our very task is to rock the boat — the ship of safety, the ship of comfort, the ship of prestige, the ship of power, the ship of wealth. If we’re not doing these things, we’re not doing it right. I’m still trying to figure out what this all looks like in my own life and witness and ministry. I do know that these present times call for more radical witness rather than less. A increasingly loud culture of nationalist idolatry demands that we preach and practice the cost of discipleship at every turn. As we try to figure that out, we would do well to gird our loins and steep our lives in prayer. Jesus Christ, give us strength and courage. Charles Stuart, martyr of the church, pray for us. 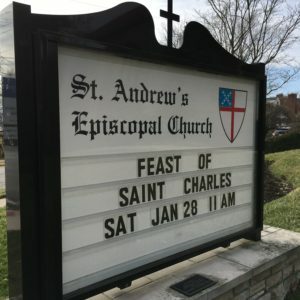 Images: Marquis sign from this weekend’s mass at St. Andrew’s, Ft. Thomas, KY; Van Dyck’s portrait of Charles I from Wikimedia Commons; an icon of Charles from Streams of the River.